Good afternoon all, I thought I would do something completely different today, not at all like the clean and simple cards I have been making recently. 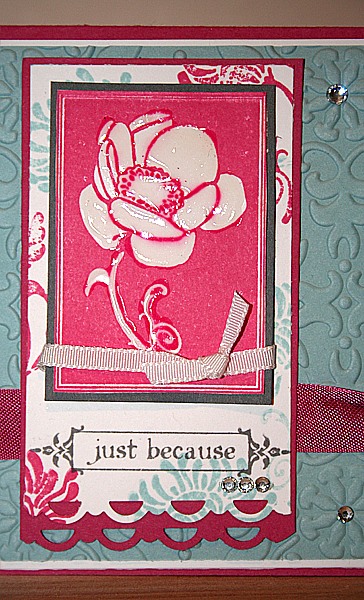 This card is linked to the other Ornate Flowers cards I made a while ago, I just didn't get a chance to make this one. 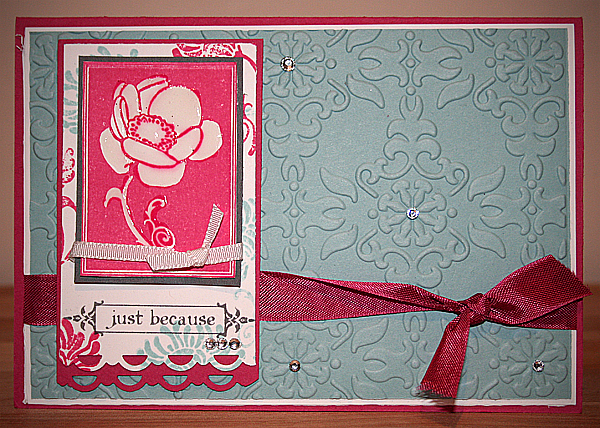 The background paper on the left hand side is from the sheet I made stamping in Rose red and Baja Breeze on Whisper White using one of the flower stamps. 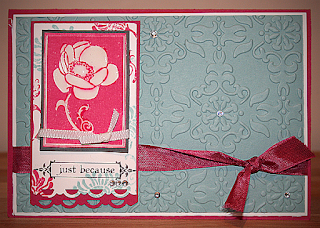 This is what Stampin' Up call a "one sheet wonder" and I was able to use one sheet on at least four different cards. This works perfectly for a challenge over at Quirky crafts their challenge being to make your own background papers. I suppose you could count the embossed and bejewelled Baja Breeze as making your own background paper as well! The blossom stamp is in Rose Red, I liked the effect but thought that it needed a little something extra so i covered the negative image, the blossom itself in Crystal Effects. The bow below it is using the new thin taffeta ribbon and I absolutely love it for little accents like this where other ribbons would overpower the rest of the card. 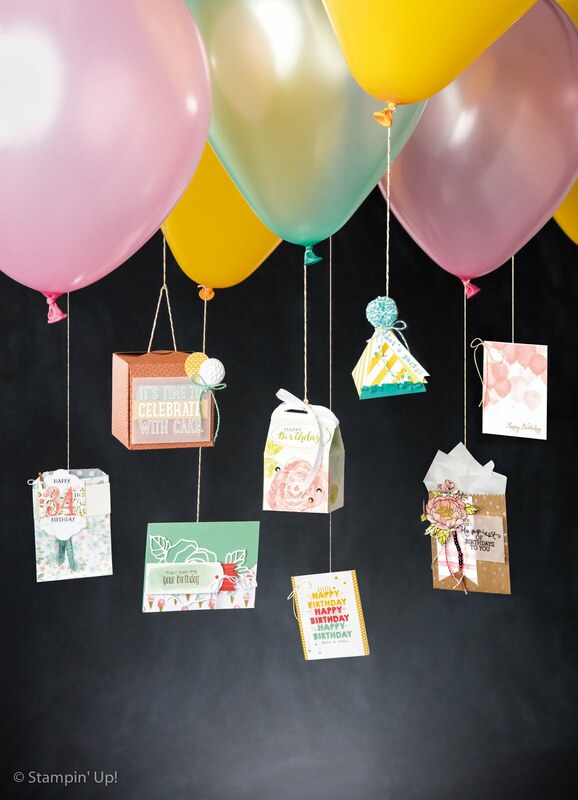 I mentioned before that I have started to really love entering challenge blogs as it makes me move out of my comfort zone, this week's challenge at papertake weekly is "anything goes". I thought that this might not make me push out of my comfort zone as there were no sketches or pre requisites to make me think. I found to my surprise though that I still tried harder than I normally would and used techniques that I had wanted to try, but weren't my style. The background for the main card is using the vintage wallpaper embossing folder. I had thought that it was too ornate for me, but I absolutely love it in this card especially dressed up with the rhinestones in the centre of the flowers. Finally, the little just because sentiment is from the Notably Ornate stamp set, i have fallen in love with this sentiment, I always mean to send "just because" cards but never do. I hope that you like this card as much as I do, thank you to everyone who has left me a comment, it means a lot. 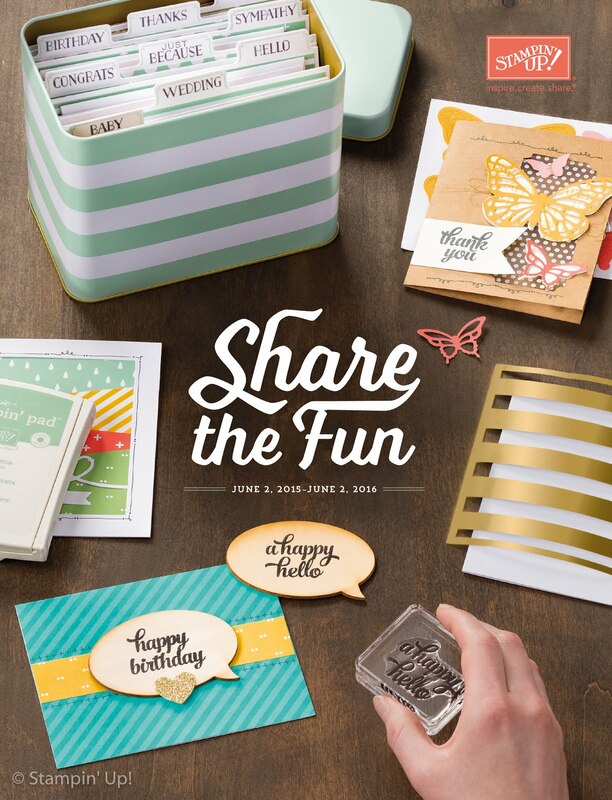 Remember that you can order all of these supplies form me 24 hours a day, and anyone who orders £25+ from me gets both current stampin' Up catalogues absolutely free! Thank you for joining Quirky Craft's tis time round. Don't forget to pop back a week this Friday/Saturday to vote for your favourites! Gorgeous combination of embossin and colours. 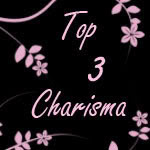 Thank you for joining in with my challenge on Quirky Crafts this week.